You cannot manage what you cannot measure! “Best in class” managers are supported by “best in class” KPI management systems and business intelligence solutions. These enable managers to rapidly analyze their business and to clearly recognize the situation in question. They serve as basis for fast decision making, drive the implementation of necessary steps and help to monitor their impact. Companies or business units such as sales and marketing, production or after-sales service that operate in a in a highly competitive environment with rising customer expectations and increasing cost pressures necessitate the continuous controlling of financial and operational results while identifying potential for improvement. 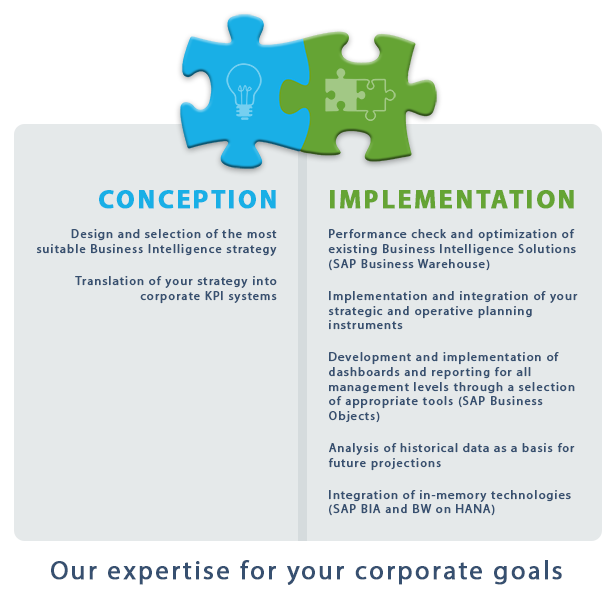 With highly qualified consultants, many years of operational experience and deep expertise in Business Intelligence systems, we are able to assist you in answering these questions with the development and implementation of tailored “state-of-the-art” solutions for you.